Khabnadideh, S., Rezaei, Z., Khalafi-Nezhad, A., Pakshir, K., Heiran, M., Shobeiri, H. (2009). Design and Synthesis of 2-Methyl and 2-Methyl-4-Nitro Imidazole Derivatives as Antifungal Agents. Iranian Journal of Pharmaceutical Sciences, 5(1), 31-36. Soghra Khabnadideh; Zahra Rezaei; Ali Khalafi-Nezhad; Keyvan Pakshir; Mohammad Javad Heiran; Hesamedin Shobeiri. "Design and Synthesis of 2-Methyl and 2-Methyl-4-Nitro Imidazole Derivatives as Antifungal Agents". 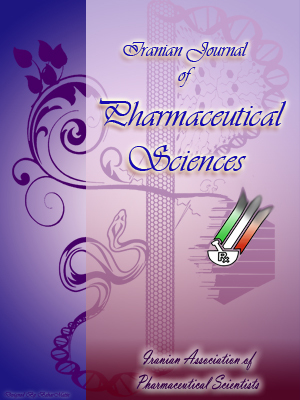 Iranian Journal of Pharmaceutical Sciences, 5, 1, 2009, 31-36. Khabnadideh, S., Rezaei, Z., Khalafi-Nezhad, A., Pakshir, K., Heiran, M., Shobeiri, H. (2009). 'Design and Synthesis of 2-Methyl and 2-Methyl-4-Nitro Imidazole Derivatives as Antifungal Agents', Iranian Journal of Pharmaceutical Sciences, 5(1), pp. 31-36. Khabnadideh, S., Rezaei, Z., Khalafi-Nezhad, A., Pakshir, K., Heiran, M., Shobeiri, H. Design and Synthesis of 2-Methyl and 2-Methyl-4-Nitro Imidazole Derivatives as Antifungal Agents. Iranian Journal of Pharmaceutical Sciences, 2009; 5(1): 31-36. Two series (a and b) of N- substituted heteroaromatic compounds related to clotrimazole were synthesized. Imidazole ring of the clotrimazole was replaced by 2-methylimidazole in series a, and by 2-methyl-4-nitroimidazole in series b. O-cholortrityl moiety of clotrimazole was also replaced by trityl, mono or dimethoxy trityl. Chemical structures of all the new compounds were confirmed by spec-trophotometric methods. These compounds docked into the active site of MT-CYP51 (PDB code, 1E9X) using Autodock tools software which showed good affinity for the enzyme. Antifungal activities of these compounds were evaluated against Trichophyton mentagrophytes, Microsporum gypseum and Candida albicans using SC, SCC and PDA as media, CHCl3 and DMSO as solvents and agar dilution assay as method. In this method 1(4-methoxyphenyl-diphenylmethyl)-2-methyl imidazole (2), 1[bis-4-methoxyphenyl-phenylmethyl]-2-methyl imidazole (3) and 1[4-methoxyphenyl-diphenylmethyl]-2-methyl-4-nitroimidazole (5) showed more than 75% activity against fungi. In the second step all of the derivatives also were evaluated against Trichophyton rubrum, Microsporum canis and Epidermaphyton floccosum using PDA medium by agar dilution method. Compound 2 showed more than 75% activity by this method. Then the most active analogue (2) was tested in RPMI 1640 medium which showed desirable biological activity in comparison to clotrimazole. Invasive fungal infections are major problems around the world, especially in immunocompromised patients. The recent expansion of antifungal drug research has occurred because there is a critical need for new antifungal agents to treat these life-threatening invasive infections. Although we have newer less toxic antifungal agents that are available for clinical use, their clinical efficacy in some invasive fungal infections, is not optimal . In recent years, the widespread use of antifungal agents has resulted in the development of resistance to these drugs by pathogenic microorganisms, causing an increase in morbidity and mortality . Thus, intense efforts in antifungal drug discovery are still needed to develop more promising and effective antifungal agents for use in the clinical arena . Selected azole drugs have supplied many effective antifungal agents, which are currently in clinical use. Drugs such as fluconazole and voriconazole can be used to treat generalized systemic mycoses. The mechanism of their antifungal action includes the inhibition of cytochrome P450 51 (CYP51), which is essential for ergosterol biosynthesis at the step of lanosterol-14-demethylation . The cytochrome P450 sterol 14 a-demethylase enzyme is the target of azoles. Azoles block ergosterol synthesis, and thereby fungal growth, by binding in the active site of the enzyme . The azoles are potent inhibitors of 14a-demethylase. The key interactions in the active site are these components: (i) at the molecular level, the amidine nitrogen atom (N-3 in the imidazoles, N-4 in the triazoles) is believed to bind to the heme iron of enzyme; (ii) the most potent antifungal azoles posses two or three aromatic rings, at least one of which is halogen substituted; (iii) the large nonpolar portion of these molecules mimics the nonpolar steroidal part of the substrate for lanestrol 14a-demethylase . In a pervious report, we described the preparation of a number of imidazole derivatives with biological interest . Here, we synthesized some new derivatives of clotrimazole. Therefore, we choose a number of different possibilities for the components in the compounds. It is also important to select compounds which have drug-like properties. The compounds are closed to clotrimazole. Figure1. Chemical structure of clotrimazole. In these new analogous the imidazole ring of clotrimazole (Figure1) was replaced by 2-methylimidazole or 2-methy-4-nitrolimidazole and also O-choloro trityl moiety of clotrimazole was replaced by trityl, monomethoxy trityl or dimethoxy trityl. Thereby, two series of new imidazole derivatives related to clotrimazole were synthesized and then the compounds docked in the active site of 14a-demethylase using Autodock program. This study was undertaken to evaluate the antifungal activity of clotrimazole derivatives on several species of fungi. All chemicals and solvents were purchased from Merck. 1H-NMR spectra were obtained on a bruker 80 spectrometer. The peaks are described in ppm downfield from TMS (internal standard). All reactions were carried out under an atmosphere of nitrogen. Thin-layer chromatography was performed using analtech 250 mm silica gel GF plates. Flash chromatography was carried out on EM reagents silica gel (230-400 mesh). Microorganisms were obtained from the Mycology and Parasitology department of the Shiraz University of Medical Sciences, Shiraz. Table1. Docking results of synthesized compounds in to the active site of MT-CytP51 (1E9X). The compounds were drawn in the hyperchem7 and minimized using the AM1 method. All the compounds as well as clotrimazole were the docked into the active site of 14a-demethylase which was obtained from Protein Data Bank (1E9X). Docking score showed these compounds docked to the active site of the enzyme comparable to clotrimazole (Table1). Different azole rings (2-methylimidazole or 2-methy-4-nitroimidazole) reacted with appreciates trityl (trityl, monomethoxytrityl or dimethoxytrityl) in a suitable solvent at reflux temperature (Scheme1). The reaction mixture was worked up to get the crude product. Purification was carried out by flash chromatography. Chemical structures of the final compounds were determined by spectroscopy methods. Azole ring, trityl moiety and triethylamine (TEA) in toluene (15-20 ml) were refluxed under an atmosphere of nitrogen for 18-22 h. Then the reaction mixture was filtered, water (3×10 ml) was added to the filtrate and the organic layers were dried over Na 2SO4, filtered and concentrated in vacuo. The crude compound was purified by flash chromatography on silica gel to give the product. Azole ring, trityl moiety, potassium carbonate and tetraethyl ammonium bromide (TEAB) in DMF (30-40ml) were refluxed under an atmosphere of nitrogen for 5-10 h. Then the reaction mixture was evaporated under reduced pressure, water and ethyl acetate were added. The organic layer was concentrated in vacuo and the crude compound was purified by flash chromatography on silica gel to give the product. Method A: Employing 2-methyl imidazole (5 mmol, 410.55 mg), triphenylmethyl chloride (2 mmol, 557.76 mg) and TEA (5 mmol, 0.69 ml) in toluene (15 ml) were refluxed for 18 h to get 1 (650 mg, 82%). 1H-NMR (CDCl3): d = 7.2-6.9 (m, 15H, Ar-H), 6.75 (s, 1H-imidazole), 6.64 (s, 1H-imidazole), 1.58 (s, 3H, CH3). MS: m/z (%): 324 (M, 1), 243 (100), 165 (52), 77 (5), 51 (2). Scheme1. A= TEA, Toluene. B=K 2 CO 3, TEAB, DMF. Table 2. Synthesis of clotrimazole derivatives. Method A: Employing 2-methylimidazole (5 mmol, 410.55 mg), 4-methoxyphenyl-diphenylmethyl chloride (5 mmol, 1544.05 mg) and TEA (5 mmol, 0.69 ml) in toluene (15 ml) were refluxed for 22 h to get 2 (1200 mg, 64.1%). 1H-NMR (CDCl3): d = 7.1-6.5 (m, 14H, Ar-H), 6.69 (s, 1H-imidazole), 6.58 (s, 1H-imidazole), 3.6 (s, 3H, OCH3), 1.55 (s, 3H, CH3). MS: m/z (%): 354 (M, 10), 273 (100), 243 (2), 195 (9), 165 (16), 77 (2), 55 (1). Method A: Employing 2-methylimidazole (5 mmol, 410.55 mg), bis-4- methoxyphenyl-phenylmethyl chloride (5 mmol, 1694 mg) and TEA (5 mmol, 0.69 ml) in toluene (15 ml) were refluxed for 19 h to get 3 (1425 mg, 74%) . 1H-NMR (CDCl3): d = 7.3- 6.6 (m, 13H, Ar-H), 6.67 (s, 1H-imidazole), 6.66 (s, 1H-imidazole), 3.7 (s, 6H, OCH3), 1.65 (s, 3H, CH3). MS: m/z (%): 384 (M, 6), 303 (78), 273 (100), 243 (12), 197 (15), 165 (26), 77 (6), 55 (4). Method B: Employing 2-methyl-4-nitroimidazole (20 mmol, 2540 mg), triphenylmethyl chloride (24 mmol, 6689 mg), potassium carbonate (29 mol, 4008 mg) and TEAB (20 mg) in DMF (40 ml) were refluxed for 5 h to get 4 (1270 mg, 17.2%). 1H-NMR (CDCl3): d= 7.55 (s, 1H-imidazole), 7.43-7.03 (m, 15H, Ar-H), 1.60 (s, 3H, CH3). MS: m/z (%): 369 (M, 14), 324 (26), 293 (23), 243 (100), 197 (24), 165 (12), 77 (13), 55 (12). Method A: Employing 2-methyl-4-nitroimidazole (5 mmol, 835 mg), 4-methoxyphenyl-diphenylmethyl chloride (7.5 mmol, 2314 mg) and TEA (5 mmol, 0.7 ml) in toluene (30 ml) were refluxed for 24 h to get 5 (1257 mg, 63%). 1H-NMR (CDCl3): d= 7.5 (s, 1H-imidazole), 7.26-6.74 (m, 14H, Ar-H), 3.76 (s, 3H, OCH3), 1.75 (s, 3H, CH3). MS: m/z (%): 399 (M, 5), 352 (27), 322 (24), 273 (78), 243 (100), 197 (45), 165 (26), 77 (20), 51 (2). Method A: Employing 2-methyl-4-nitroimidazole (5 mmol, 952.5 mg), 4- methoxyphenyl-diphenylmethyl chloride (5 mmol, 1693.9 mg) and TEA (5 mmol, 1 ml) in toluene (30 ml) were refluxed to get 6 (1010 mg, 47%). 1H-NMR (CDCl3): d= 7.51 (s, 1H-imidazole), 7.31- 6.78 (m, 13H, Ar-H), 3.74 (s, 6H, OCH3), 1.62 (s, 3H, CH3). MS: m/z (%): 429 (M, 8), 352 (17), 322 (30), 303 (40), 243 (100), 197 (35), 165 (29), 77 (6), 55 (4). Table 3. Antifungal activity (inhibition%) of clotrimazole derivatives. Sabouraud dextrose agar (S) plus chlo-ramphenocol (SC) and cyclohexamide (SCC) were used for subculture and maintenance of the fungi before testing. Sabouraud dextrose agar, potato dextrose agar (PDA) and RPMI 1640 media were also used for agar dilution and macrodilution methods. The clinical isolates of fungi including Microsporum canis, M. gypseum, Trichophyton mentagrophytes, T. rubrum, Epidermaphyton floccosum and Candida albicans were purified and subcultured on SC, SCC, and PDA media before testing. The stock solution of compounds was prepared in CHCl3 and DMSO at a concentration of 1000-5000 μg/ml. Agar dilution assay and macrodilution method were used to establish the minimum inhibitory concentration of synthetic derivatives [6, 7]. The compounds were diluted in solid and broth media to obtain final concentration from 0.0625-64 μg/ml, using PDA and RPMI 1640 media. The inocula of the molds and yeast were obtained from 2-7 days old colonies. In agar dilution assay for dermatophytes, an equal portion of each dermatophyte colony were cultivated on the middle of the solid media and incubated at 25 C for 10-14 days. The diameters of fungal colonies were measured during the incubation period and the results were recorded. By this method for Candida species, fungal suspension was prepared in sterile water and the concentration was adjusted to 0.5 MC Farland standards to obtain final concentration 0.5-2.5×103 CFU/ml and streak on SC media, using sterile cotton-tipped swabs and incubated at 35 C up to 48 h. For macrodilution assay, serial dilutions of compound was prepared and along with the fungal suspension were added to RPMI 1640 media and incubated at 35 C for 24-48 h.
Drug free media with and without solvents and clotrimazole were used as controls. In agar dilution assay the end point for each compounds were defined as at least 80% inhibition of colony growth in compared with plate controls. In macrodilution assay, the end point for each compounds were defined as at least 80% of reduction in turbidity in compared with those of controls. The 11.5 software SPSS Inc, Chicago, IL was used for data process. The data were presented in Table 3. In recent years, the developments of resistance to currently available antifungal azoles as well as clinical failures in the treatment of fungal infections have been reported . In the course of our search for therapeutically useful antifungal azoles, we designed 2-methyl and 2-methyl-4-nitro derivatives of clotrimazole depicted by general formula 1-6. Two series of clotrimazole derivatives were synthesized using methods A or B (Scheme 1). Each seri contains three analogues. The results of chemistry section are summarized in Table 2. All derivatives could be prepared by method A with high yield except compound 4. For this analogue we used method B but still the yield was low. The microbiological evaluation carried out on all new synthesized compounds included in vitro assays for antifungal activities. First, all compounds were tested against T. mentagrophytes, M. gypseum and C. albicans using SC, SCC and PDA media. In this section compounds 2, 3 and 5 showed more than 75% and compound 6 more than 50% antifungal activity on the microorganisms. Compound 4 had no effect on the T. mentagrophytes in this step. In the second step T. rubrum, M. canis and E. floccosum in PDA medium were used to determine the antifungal activity by agar dilution method. The results revealed that the compound 2 had more than 75% and the compounds 3 and 5 had more than 50% antifungal activities on the fungi. Compound 4 had no effect on the fungi. SAR studies in our results showed one methoxy group is essential for antifungal activity because compound 1 had no significant activity. But the second methoxy group can reduce the activity (as compound 3 is less active than compound 2). It is also suggested the nitro group diminishes the antifungal activity because compound 4 had no effect on the fungi. But by adding one or two methoxy groups can prevail over this reduction in activity as compound 5 and 6 were more active than compound 4. As no one of the above compounds were active against C. albicans, the most active compound (compound 2) was chosen for testing in RPMI 1640 medium by macrodilution method against three different species of C. albicans. This analogue had similar effect to clotrimazole but the MIC was higher than clotrimazole. In comparison to the agar dilution method the values for MIC has lower amounts in the macrodilution method. The data are presented in Table 3. Although the compounds 4, 5 and 6 had the best docking energy, but in the biological study, compound 2 was the most active compound. Vincent TA. Current and future antifungal therapy: New targets for antifungal agents. J Antimicrob Chemother 1999; 44: 151-62. Giulia M, Luisa Me, Paola F, Silvia S, Angelo R, Luisa MO, Francesco B, Roberta L, Chiara M, Valeria M, Paolo LC, Elena T. Synthesis, antimicrobial activity and molecular modeling studies of halogenated 4-[1H-imidazol-1-yl(phenyl)methyl]-1,5-diphenyl-1H-pyrazoles. Bioorg Med Chem 2004; 12: 5465-83. Xiao L, Madison V, Chau AS, Loebenberg D, Palermo RE, McNicholas PM. Three-dimensional models of wild-type and mutated forms of cytochrome P450 14a-sterol demethylases from Aspergillus fumigatus and Candida albicans provide insights into posaconazole binding.Antimicrob Agents Chemother 2004; 48: 568-74. John HB, John MBJ. Wilson and Gisvold's textbook of organic medicinal and pharmaceutical chemistry. 11th ed: Philadelphia: Lippincott Williams & Wilkins, 2004; pp. 217-81. Khabnadideh S, Rezaei Z, Khalafi-Nezhad A, Bahrinajafi R, Mohamadi R, Farrokhroz AA. Synthesis of N-alkylated derivatives of imidazole as antibacterial agents. Bioorg Med Chem Lett 2003; 13: 2863-5. Liu Y, Yortora G, Ryan ME, Lee HM, Golub LM. Potato dextrose agar antifungal susceptibility testing for yeasts and molds: Evaluation of phosphate effect on antifungal activity of CMT-3. Antimicrob Agents Chemother 2002; 46: 1455-61. Yashida T, Jono K, Okonoji K. Modified agar dilution susceptibility testing method for determining in vitro activities of antifungal agents, including azole compounds. Antimicrob Agents Chemother 1997; 41: 1349-51. Ram SU, Sanjay J, Neelima S, Nawal K, Ramesh C, Sudershan KA. Synthesis of novel substituted tetrazoles having antifungal activity. Eur J Med Chem 2004; 39: 579-92.